Even finger-snapping Thanos would love this: taking photos and videos without the hassle of having to bring out your camera or smartphone. Snap, the developer and owner of popular social media app Snapchat, announced that it is bringing its very own weapon into the wearables wars, Spectacles, to the UAE. Khaleej Times was among the select few in the country to first test out the 'smartglasses'. The drill is simple: you connect Spectacles to your smartphone via Snapchat, and you're good to go. They are sunglasses with two circles mounted on top. The one on the left is a camera, capable of taking photos and videos. To capture shots, you need to press the button on top of it; a short press takes a 10-second video, which can be extended by pressing again, while a long press takes a photo. In either case, there's a light indicator behind it that can be seen by the wearer, notifying when a shot is being taken and when it ends. On the opposite side is an LED indicator, a key feature because it lets people be aware that the device is in use and photos or videos are being taken. The UAE has strict rules when it comes to privacy; the mere fact that it has allowed Spectacles to be sold in the country means that the Snap product has met all criteria required. A sample of an image taken with the new Spectacles. Its resolution is twice its predecessor's. The original Spectacles was released on November 10, 2016, sold on pop-up vending machines called Snapbots. It became available online in February the following year. While not exactly a massive hit - it sold around 220,000 units during its run - it was still enough for Snap to see the potential in it; other makers decided to cease or suspend production, most notably Google Glass. The second-generation device has a resolution 50 per cent higher than its predecessor, improved mics and Wi-Fi transfer, plus the ability to be used underwater. A third version is also rumoured, and it may come with a dual-camera. 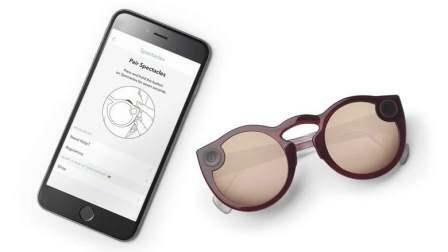 The new Spectacles was initially released in the US, Canada, UK and parts of Europe. As for the UAE, Snap says that "A very limited number is now available for pre-order from SouqDOTcom and virginmegastore.ae with wider availability coming to selected Virgin Megastore and Emax outlets across the UAE in the first week of June."